The levels of organization in the human body consist of cells, tissues, organs, organ systems and finally the organism. The smallest unit of organization is the cell. The next largest unit is tissue; then organs, then the organ system. Finally the organism, is the largest unit of organization. The smallest unit of organization is the cell. You are made of cells. Cells are the basic units of structure and function in living things. This means that cells form the parts of an organism and carry out all of an organism’s processes, or functions. The invention of the microscope made it possible for people to discover and learn about cells. The smallest unit of organization is the cell. The next largest unit of organization in your body is a tissue. A tissue is a group of similar cells that perform the same function. The human body contains four basic types of tissue: muscle tissue, nervous tissue, connective tissue, and epithelial tissue. Like the muscle cells that form it, muscle tissue can contract, or shorten. By doing this, muscle tissue makes parts of your body move. While muscle tissue carries out movement, nervous tissue directs and controls the process. Nervous tissue carries electrical messages back and forth between the brain and other parts of the body. Your stomach, heart, brain, and lungs are all organs. 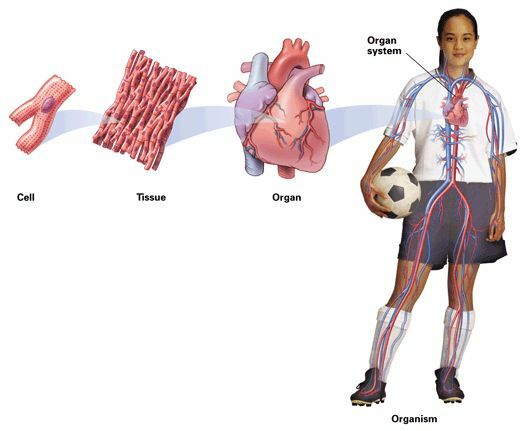 An organ is a structure that is composed of different kinds of tissue. The heart, for example, pumps blood throughout your body, over and over again. The heart contains all four kinds of tissue: muscle tissue, nervous tissue, connective tissue, and epithelial tissue. Each type of tissue contributes to the over all job of pumping blood. Each organ in your body is part of an organ system which is a group of organs that work together to perform a major function. Your heart is part of your circulatory system, which carries oxygen and other materials throughout the body. Besides the heart, blood vessels are major structures in the circulatory system.